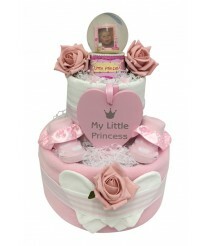 We are asked a lot about our product packaging and will the gifts arrive safely. Well here's how they do 100% of the time to all corners of the uk. 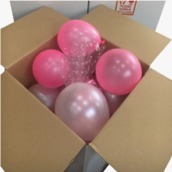 Our products are individually gift wrapped and then placed into custom made white boxes and filled with colour co-ordinated mini balloons. Fragile stickers are attached and then sent with love from us to you! Nappies, dummies, bubble bath, blankets and bibs aren’t the most glamorous of gifts to receive when you’re expecting a baby, however necessary they may be. 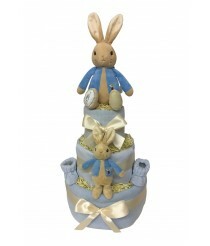 Here at Dinkytoes we create beautiful decorative non edible nappy ‘cakes’ containing all of the essentials for any mother-to-be and new parents. 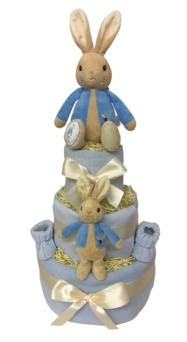 Whether it’s a classic tiered nappy cake, topped with an adorable soft toy, a simple sock cupcake or one of our baby hampers, we've got it covered for every budget. 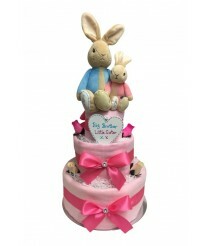 Baby showers are becoming more and more popular in the UK, with friends and family gathering to ‘shower’ the expectant mum with gifts, advice and some much needed friendly company in the last few weeks before baby arrives. 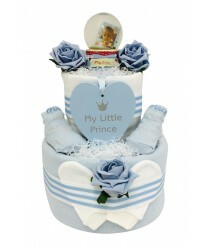 A Dinkytoes Nappy Cake is the perfect baby gift for such an occasion. Sit back and watch as your star guest squeals with delight at her thoughtful and magnificent centrepiece. 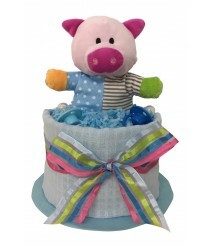 A Dinkytoes Nappy Cake is also the perfect choice to send your colleague off on maternity or paternity leave – when you simply can’t find the perfect gift, give them the essentials. 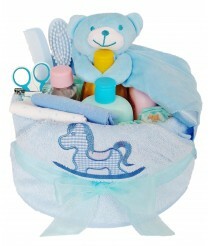 Bouquets are no longer accepted in hospital so why not greet the new baby arrival with one of our baby clothing bouquets, filled with rolled baby clothing and artificial foam flowers. Ingredients Pampers size 3 Muslin Square Soft Toy 2 Soother.. Ingredients: 50 Pampers size 3 Soft Blanket Muslin Square F.. Ingredients: 60 Pampers size 3 Soft Blanket Muslin Square B.. This cute little baby boys first doll sitting in his crib, which has been expert.. 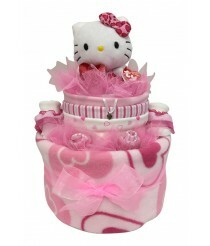 Ingredients: Pampers Size 3 1 Soft Blanket 3 Burp Cloths 1 .. Ingredients: Pampers size 3 approx 36 Baby Wrap Baby Brush .. Ingredients: Pampers Size 3 approx 54 Fleece Blanket Muslin Squar.. Ingredients: Pampers Size 3 approx 54 Fleece Blanket Mu..
Nappy Cake Ingredients Pampers size 3 approx 50 Soft Blanket Musl.. 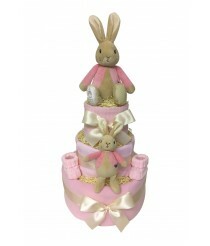 This cute little cuddly kitten sits on top of this two tier cake. 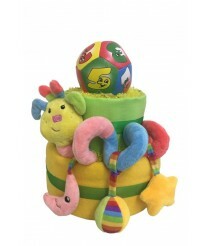 Little kitten plays with his toy b..
Nappy Cake Ingredients: Pampers size 3 approx 60 Soft Blanket 2 M..
Nappy Cake Ingredients: Pampers size 3 approx 54 Baby Blanket Mus..
Bathtime - that special time between a parent and child where nothing else matters. Give your baby y.. 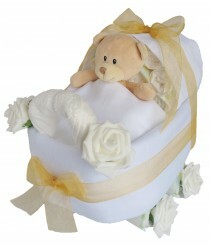 Delight the Mummy-To-Be with this impressive pram nappy cake. Moulded expertly into shape, it com.. Ingredients: 50 Pampers size 3 Luxury Bobble Blanket Muslin Squar..
Nappy Cake Ingredients: Pampers size 3 approx 50 Baby Blanket Mus.. Ingredients: Pampers size 3 approx 60 Soft Blanket 2 Muslin Squar.. These are BIG cakes! 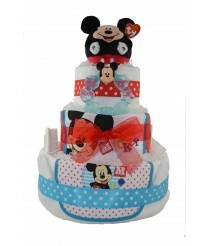 Each cake is simply bursting with essentials including around 60 pamp..
Nappy Cake Ingredients: Pampers size 3 approx 60 Baby Blanket 2 M..
Deluxe neutral nappy cake with 3 impressive tiers full of everything a new mummy could need to ..
Nappy Cake Ingredients: Pampers size 3 approx 60 2 Baby Blankets ..